Griping about air travel is about as fresh as in-flight coffee, but there are a ton of ways to tweak the details and make flying genuinely enjoyable. If you could do anything to improve the flying experience, what would it be? We posed this question to a handful of creative folks, and we'll be sharing their big ideas with you this week. 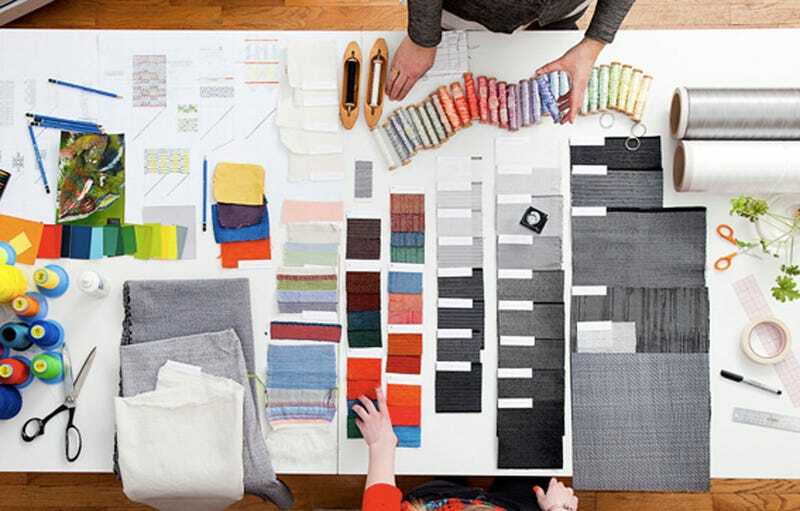 Up first is Elizabeth Whelan, a New York-based textile designer who's worked with Nike and Humanscale, and who has her finger on the pulse of next-level smart fabrics. "I recently flew to Shanghai from New York and, when I opened up the little care-package blanket, it smelled like mildew. My first reaction was to the odor, but as a designer I was like, 'Why are they using fleece?' Manmade yarns get tired so quickly. I know that they'd have to stay within fire codes, but a nice wool blanket woven with superlamb—a natural, washable wool that holds its color—finished with NanoSphere technology would make it completely stain-resistant and last through so many washes. Fleece is also so bulky (and cheesy, really); you could produce a blanket that was a lot thinner and warmer." NanoSphere tech repels water, dirt, and oil, with a hat-tip to the self-cleaning surface of plants. Superlamb—get a load of these colors! "I always find the seat-back pockets to be really obnoxious—they're difficult to open, it's impossible to see what's inside, and it's tough to get things in and out. But they're actually pretty helpful to store your own things. I would love to redesign the pouch and how it works, so it could hold more than SkyMall and the airline safety cards in a beautiful material that isn't so harsh." "When you walk through the cabin door to find your seat, the first impression is that you're getting packed in instead of settled in. But people respond to tactility; everything could be so much more beautiful. That molded plastic used for the overhead bins is everywhere—tray tables, armrests—and it's always the same not-quite-putty, not-quite-white color. What about taking the window-shades and creating visual interest? Something that's not the same color as the wall. Or even embedding designs or textures in the little handle would make it more personal. Hella Jongerius just redid the [World Business Class] cabins for KLM, and she worked with all the finishes, using patterns and stripes. It really creates a sense of visual curiosity. Or, in the waiting area at the Osaka airport, all the lounge seating is in these great different colors; these bright elements are exciting and special." Hella Jongerius managed to update an airplane interior with textures and patterns that would actually look pretty fun'n'funky outside of the cabin. Osaka Airport by IvanWalsh.com via Flickr. "I'm finishing up a luggage project for Tumi which uses this Tegris material; it's really lightweight, and almost as strong as carbon fiber. If it can be molded into a lightweight bag, maybe it could also be used to create a lightweight overhead bin to replace the molded plastic. Airlines are always looking to lighten their loads." Tegris is so strong that it's being used for Riddell football shoulder pads and NASCAR door panels. "There's so much potential for light and fabrics on a plane. I would start looking at smart textiles: installing LEDs into the aisle to guide you to the bathrooms or exits, or—and this is luxurious—putting them in the ceiling to look like stars. Maybe you could weave glow-in-the-dark-yarns to find things when the lights go out." Philips and Desso's new light-transmissive, LED-powered carpets.